Eight years have passed since the young Princess Bitterblue, and her country, were saved from the vicious King Leck. Now Bitterblue is the queen of Monsea, and her land is at peace. But the influence of her father, a violent psychopath with mind-altering abilities, lives on. Her advisers, who have run the country on her behalf since Leck’s death, believe in a forward-thinking plan: to pardon all of those who committed terrible acts during Leck’s reign; and to forget every dark event that ever happened. Monsea’s past has become shrouded in mystery, and it’s only when Bitterblue begins sneaking out of her castle – curious, disguised and alone – to walk the streets of her own city, that she begins to realise the truth. Her kingdom has been under the thirty-five-year long spell of a madman, and now their only chance to move forward is to revisit the past. It was lovely. Definitely recommend. What a ride! Bitterblue is an up-and-down, full of twists, intriguing end to the Graceling trilogy. I read Graceling last summer and quite enjoyed it. This summer, I finally dove into Fire and Bitterblue. Unlike most series, the books aren’t continuing the same story one after another. Graceling introduced the world and many of the characters. Fire was a prequel that allowed us to see where King Leck came from and learn about a part of the story’s world that most of the characters don’t know about. Bitterblue takes things full circle and starts eight years after Graceling ends. While the lag between reading the first and third books made it a little hard to follow at a few points, the intervening years in the story made it easier to jump back in – the characters themselves have grown and changed. Cashore does a great job of sprinkling bits from the first two books throughout the third, and even allows the reader to know things before the character (thanks to things we learned in book two). 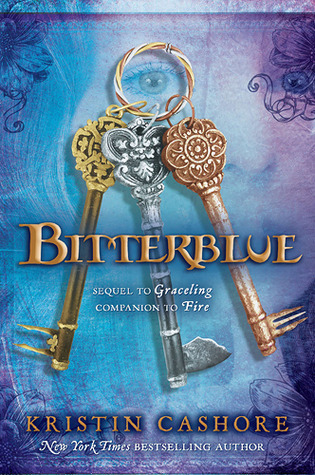 Bitterblue is full of mystery, self-discovery, and betrayal as young Queen Bitterblue comes into her own, meets her people on a real level, learns to stand up for herself, and learns to govern her kingdom her own way. Bitterblue has grown up, but she’s still young and still learning how to be queen. My favourite part of this book was seeing how she develops into an adult who is willing and able to question her much older advisors and ultimately make her own decisions based on her own research rather than just doing what is recommended. There’s also a lot of action, a lot of humour, and a little bit of romance. Also, first loves that don’t stay as the only love. Hooray! This is a series that I will be rereading. It’s a lot of fun and full of layers. Have you read the Graceling Realm trilogy? What did you think? I've been a book lover since I started deciphering words as a toddler. Now, I'm a reader, a writer, and an editor. This blog is a place to discuss books and life and all that those two entail.